Spiti Valley, surrounded on all sides by the soaring snowy ramparts of the high Himalaya, lies along India’s northern border with Tibet in the state of Himachal Pradesh. It is a remote, high altitude, cold desert region of sheer cliffs and barren slopes, of plunging gorges and towering ridges, which expose layer after layer of ancient twisted rock, thrust from the depths of the ocean to form the roof of the world. A mile above the valley floor the highest, frozen summits pierce a brilliant, deep blue sky, which but rarely softens into rain, for even the Indian subcontinent’s life-giving monsoon cannot surmount Spiti's mountain barriers. 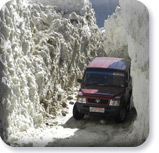 A meter or two of winter snow, now rendered less dependable by global warming, provides a scanty flow of water in spring and summer to irrigate the patchworks of tiny, yak-ploughed fields. Winter is long and fertile soil is scarce, so farming is marginal with little cash income. Snow may lie on the fields for six or even seven months of the year. The snow leopard maintains its elusive presence; nor are its main prey species, such as the blue sheep (bharal) and ibex, much molested by villagers of the upper settlements, despite the losses to them of domestic animals and crops. The approximately ten thousand inhabitants live in tiny villages scattered like the beads of a broken rosary across the rugged landscape. 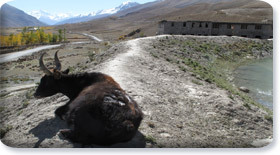 Dried yak dung remains the main source of fuel for cooking and for heating the mud houses, even though the temperature dips to -35ºC in the depths of winter. It is assiduously collected from the grazing grounds all through the summer and autumn. Government schemes have lent some occupational diversity to the people of the area but subsistence agriculture combined with pastoral activity is the mainstay of the majority. As of 2012 the Indian Government has set the family poverty line at INR. 27,500/- (US$ 490, £ 316) income per annum. The Block Development Office in Kaza, the Spiti capital, identifies 1,105 out of a total of 2,545 families in the valley, 43%, as living below that line. Spiti people are Indian by birth and nationality, but their language is a dialect of Tibetan and their culture a far flung outpost of the peaceful Buddhist culture that has suffered such destruction in Tibet itself. The great translator of the Buddha’s ‘Perfection of Wisdom Sutras’ from Sanskrit into Tibetan, Rinchen Zangpo, visited Spiti Valley a little over a thousand years ago. His residence in the valley marks the awakening of the intellectual life of the Spiti people and the beginning of their known culture. Murals, astonishingly pure in line and color, that date all the way back to that far-off dawn can still be seen at Tabo Monastery, the ‘Ajanta of the Himalayas’. Our Society, inspired by the example of this great teacher and practitioner who stands at the beginning of our recorded history, seeks like him to set a new standard of educational opportunity for the youth of Spiti. 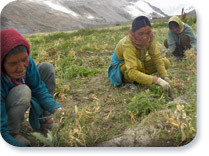 For this reason we named it the Rinchen Zangpo Society for Spiti Development. Naturally cut off by great mountain barriers and by a long winter that disrupts road traffic, Spiti became more isolated still when its close economic and cultural ties with Tibet were abruptly snapped by the Chinese takeover of that country in 1959, and from then on until 1992 the entry of even Indian outsiders was restricted due to the proximity of the adjoining hostile border. 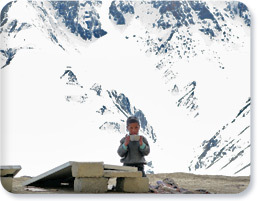 This isolation left Spiti undisturbed but kept it economically backward and educationally deprived. To meet these deficiencies, the Rinchen Zangpo Society for Spiti Development was founded in 1993, soon after entry restrictions into Spiti were lifted. It was the first successful non-government organization in the district. An education program was undertaken as the first priority because the standard of education in existing (government) schools was, and still is, extremely low. No young Spitian who has passed through the government school system in the valley has ever qualified to study one of the major professions, such as medicine, in spite of the enthusiastic backing of parents. Not only that, the teaching of our own language, Tibetan (Bhoti), is minimal, ceasing after primary level, and children leave school hardly able to read even the titles of the Buddhist scriptures. Key (Kyil) is the largest monastery in Spiti. It is strikingly situated in upper Spiti a few miles upstream from the chief town of Kaza and across the river from Munsel-ling School. The present structure dates from the fifteenth century. It was built by a direct disciple of Je Tsongkhapa, central figure of the Gelug sect of Tibetan Buddhism. His Holiness 14th Dalai Lama bestowed the Kalachakra initiation there in 2000. Old Dhankar Monastery is spectacularly situated halfway between Kaza and Tabo on a 300 metre high spur overlooking the confluence of the Spiti and Pin Rivers, its chapels tucked into niches in the cliff face. There’s an old fort and a quite hidden village up there too! 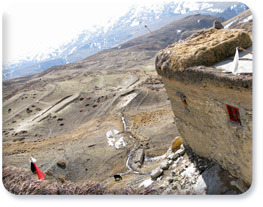 Dhankar was the capital of Spiti in the seventeenth century. New Dhankhar Monastery is below near the village of Sichilling. It follows the Gelug tradition of Tibetan Buddhism. Tabo Monastery was founded in 996 AD by King Yeshe O’d, ruler of large areas of western Tibet. His teacher was Rinchen Zangpo, one of the great translators of Buddha’s word from Sanskrit into Tibetan. Tabo is probably the oldest continuously functioning Buddhist monastery in India and the Himalayas. The temples and caves contain magnificent artwork, murals and clay statues, from many different centuries, the best being the earliest, dating all the way back to the original foundation. Tangyud Monastery has two sites, one high above the valley floor at an altitude of 4,500 metres in the vicinity of Komik Village and the other in Kaza, the Spiti capital. It is thought to be at least 800 years old and follows the Sakya tradition of Tibetan Buddhism. The splendid new temple on the Kaza site was inaugurated by His Holiness the Dalai Lama in 2009. Kungri is Spiti’s only Nyingma Monastery. It is located on a tributary of the Spiti river in Pin Valley, across the river from the village of Sangnam. An ancient foundation, it has recently been extensively rebuilt.